Computer-mediated communication has become the foremost means of sharing knowledge in today’s knowledge-based economy. 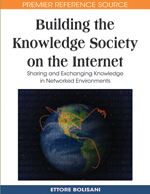 However, not all Internet-based knowledge-sharing channels are created equal: they differ in their effectiveness when used for exchanging knowledge. A number of factors influence the efficacies of knowledge exchange, including: (1) characteristics of the knowledge being exchanged and, (2) characteristics of the channels used. It is therefore necessary to define key knowledge and channel attributes in order to understand how knowledge can be effectively shared using computers. This chapter examines the computer-mediated knowledge sharing mechanisms and proposes a typology based on media richness and social presence characteristics that can serve as a preliminary conceptual basis to select the most appropriate channel. The chapter concludes with a discussion of key issues and future research directions. While much of the research has been done in organizational settings, the chapter is applicable to all forms of computer-mediated communication.